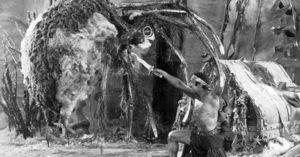 Douglas Fairbanks gets his swashbuckling mojo back in this fabulous, dream-like fantasy that features the star at his most expressive and balletic, swaggering, leaping, and pantomiming through a fable from the Arabian Nights. The costumes are eye-popping and opulent, with towering hats—I mean, they look like actual towers—and curly-toed shoes to die for. The fanciful sets (by William Cameron Menzies) are fairy-tale tall and studded with grips so Fairbanks can clamber all over them. In its own way the film is as excessive as Robin Hood, but this time every excess is in service to the story, which moves quickly and stays focused, even with a running time of almost two and a half hours. A lot of the credit for this should probably go to the director, the great Raoul Walsh, in an early effort from a long career that would later include such classics as High Sierra and swashbucklers like Captain Horatio Hornblower. Warning: this film has long been in the public domain, and there are a lot of crappy digital transfers out there. A lot of care went into restoring the Cohen Film version, and that’s the one I recommend.